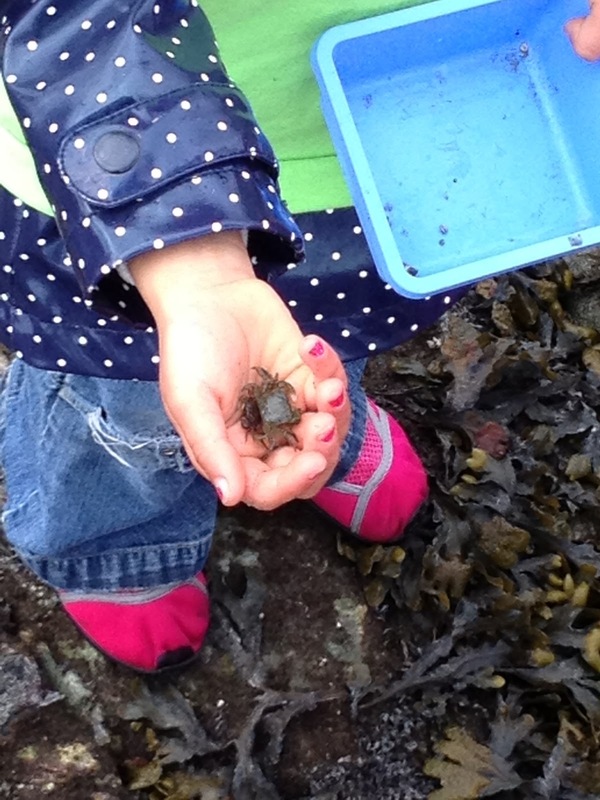 My daughter holding crabs from Willows Beach. They scuttled off her hand seconds later. I am a copious unpublished writer but never have used the blog format. What has motivated me to use this platform? Why now, you may wonder? Two weeks back I heard both Dr. Vandana Shiva and Rob Stewart speak here in Vancouver and Victoria. I have since lain awake at night wondering how can *I* change the world? How can I stop the poisoning of the bees and birds – and humans!? Me? stop the rising acidity of the oceans which is killing the life in the oceans?! ‘I am just one voice, how can I make a difference?’ I’ve been hand-wringing, wondering what to do? I’m not an “activist”. But if I don’t do something, how can I live with my conscience? I can’t. Then yesterday, thanks to Nathalie Chambers, I read “What Kind of World do you Want?” by Jim Lord. From the turmoil of the last two weeks, I am now confident that the only way to better our word is to envision it. I’m seeing the change, seeing the ability. My projections over the past weeks and my desires to be the change actually materialized when I was asked to join the Advisory Board of the University of Victoria’s School of Environmental Studies. I am searching for projects to help raise our collective awareness and create an shift of understanding. I’m praying. I’m focusing on all that is right is the world, because the world is full of way more good than evil. Our hearts are full of love, let them overflow. Let our eyes be blinded by the greatness in every being. Let our noble ideals become our reality. See it, project it, create it. I envision a world where due respect given to all life on our planet, from plankton to primates. A world where we find heroism in the smallest act of kindness. A world where we laugh at the joyful and the ridiculous. Where we find strength in love, in the righteous and revert to the golden rule on this convoluted path of life. This entry was posted in Uncategorized on April 16, 2013 by Gurdeep Stephens.